AUSTIN, TX – Austin-based Miró Rivera Architects announce the completion of the Austin360 Amphitheater at the Circuit of The Americas. 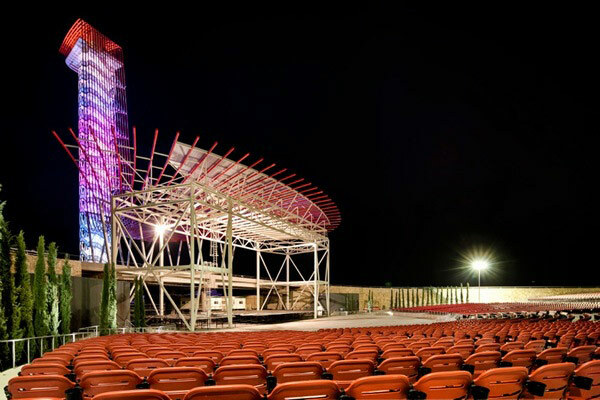 The amphitheater will serve as Central Texas’ new world-class home for outdoor entertainment. 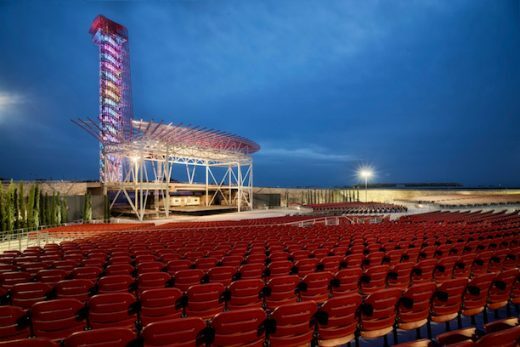 The 6,761-seat amphitheater is the largest outdoor amphitheater in Central Texas, with total spectator capacity of 15,000 people. The amphitheater, carved into the center of the Circuit of America’s Grand Plaza, uses the topography of the site to enhance acoustics and views of the performer. Spectators will enter the amphitheater at the back of the lawn and descend toward the stage passing two tiers of fixed seating with a capacity of 5,233. The front center section of the fixed seating with its premium views of the stage are occupied by nine rows of box seats. The floor seating area gives the venue the flexibility to host a variety of events with options for an additional 1,528 temporary seats, banquet tables, or standing room areas. 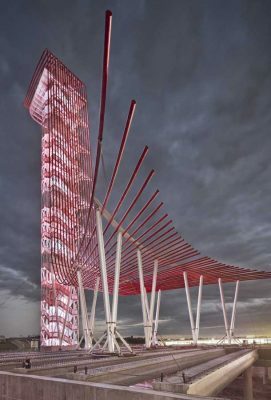 The stage itself is located at the base of the observation tower whose red steel tubes start at the top of the 251 ft tall tower, spill down and spread out to form a canopy over the stage. The canopy protects performers from the elements and acts as the stage’s hanging grid to support stage lighting and speaker arrays. 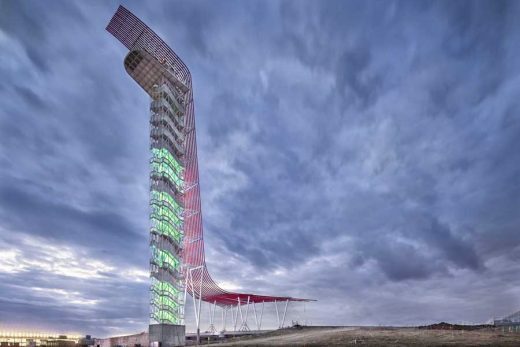 The Observation Tower and Austin360 Amphitheater serve as a memorable backdrop for the Circuit’s Grand Plaza. The 27-acre plaza, bordered by the track on three sides, lies in the heart of the Circuit and defines the public experience of the complex for most users entering the venue. As visitors enter the plaza they are greeted by a large hardscaped plaza and lawn containing a nearly 16,000 sq. ft. reflecting pool. 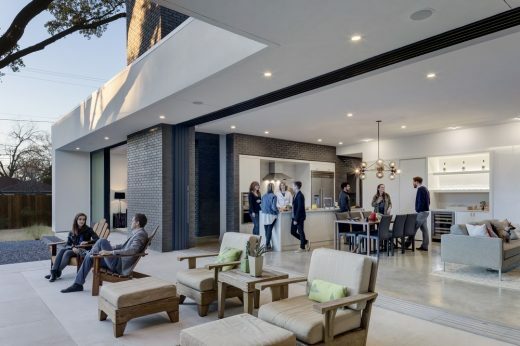 With the reflecting pool at one end of the plaza and tower and amphitheater at the other, this strong axial relationship across the plaza creates a dramatic moment of arrival. The plaza contains varying landscape zones that enclose the plaza and define unique areas of activity. The plaza’s location inside the arc of the track captures the energy of racing: its speed, noise, and excitement. The race rushes around visitors on all sides, heightening the experience of the track. In addition to its race day duties, the Grand Plaza contains a monumental lawn, sized to accommodate a variety of events throughout the year including sporting events, festivals, and pre-concert activities. The lawn is connected to a promenade along the north side of the plaza which contains concession stands, retail areas, rest room facilities, and the Turn 15 Grandstands. The buildings of the promenade create a trellis-covered boulevard which serves as a significant gathering point for visitors enjoying the many activities of the Grand Plaza. At the end of this promenade visitors will find a pedestrian bridge at Turn 16 which connects visitors to the track infield and to another bridge at Turn 3 which allows visitors to completely cross the track. As the designers of the main public spaces and buildings around the 3.4-mile track, Miró Rivera Architects are responsible for the aesthetic and much of the experiential qualities of the site. The architectural language of the facility evokes the precision, dynamism and performance-driven design of racecars. 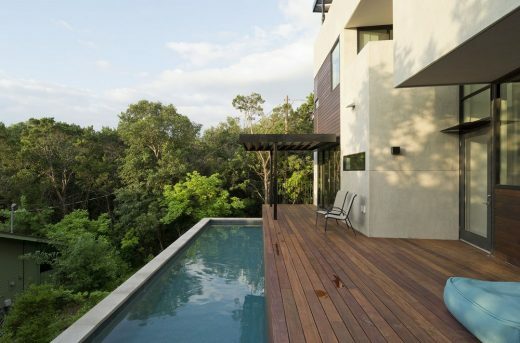 It is also visually stimulating, incorporating banners, billboards and bold graphics. 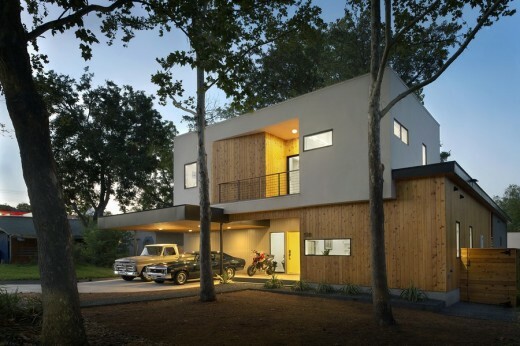 The architects bring their innovative approach to the structural systems: rather than being concealed behind a building’s façade they are articulated and become significant parts of the design. An architectural theme reoccurring throughout the site is the use of red steel tubes. 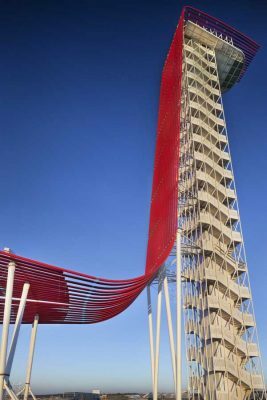 The tubes cascade down the side of the Observation Tower to form a canopy for the Amphitheater stage and also frame the Main Grandstand. Evocative of sports cars and movement, this element ties the structures together creating a consistent visual experience. 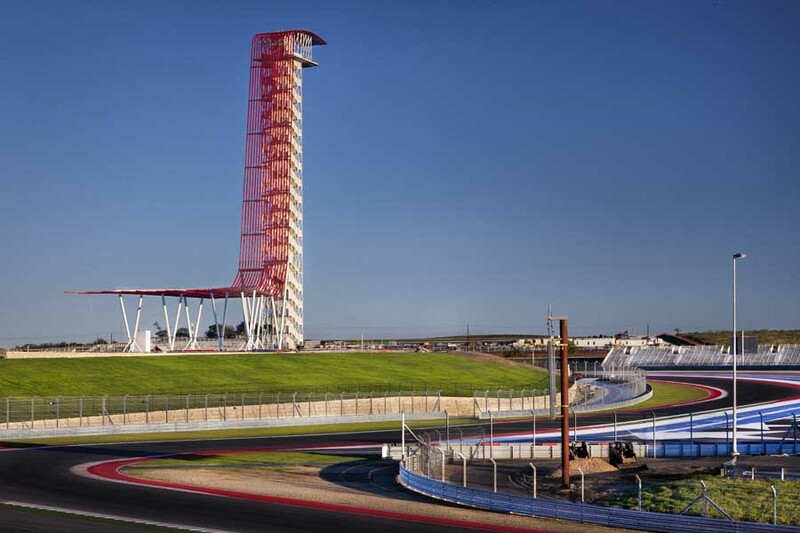 Located southwest of downtown Austin, the Circuit of the Americas will be the host to the United States Formula 1 Grand Prix, MotoGP, V8 Supercar, and American Le Mans races starting with the inaugural race on November 16-18, 2012. 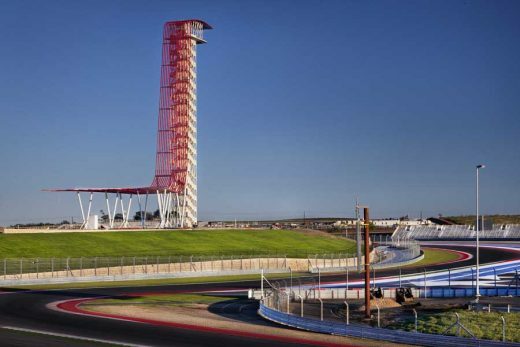 Built around a 3.4 mile racetrack, the facility has the capacity for 120,000 visitors and will become a significant attraction for the city of Austin. 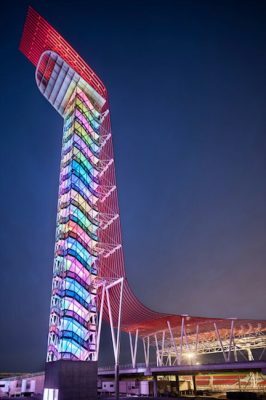 Miró Rivera Architects designed the entry sequence into the facility, Grand Plaza, Observation Tower, Tower Amphitheater and Main Grandstand. Bordered by the track on three sides, the 27-acre Grand Plaza lies at the heart of the Circuit complex. Its location inside the arc of the track is situated to capture the energy of racing: its speed, noise, and excitement. The race rushes around visitors on all sides, heightening the experience of the track. 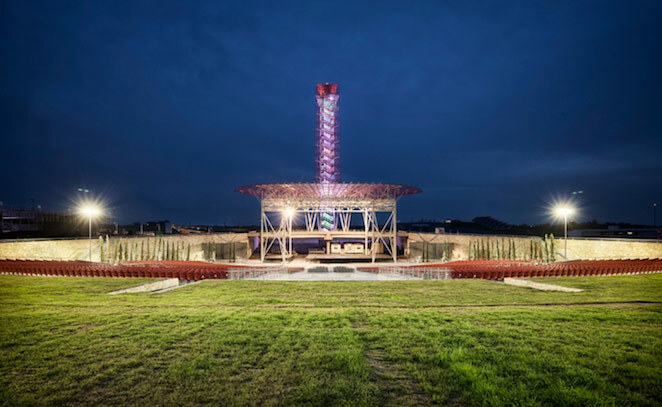 Miró Rivera Architects designed all hardscape and softscape features, entry sequence, ticket building, reflecting pool, support building, concessions, restrooms, and pedestrian bridges within the Grand Plaza. These areas define the public experience of the Circuit complex for most users entering the venue. Visitors pass through the main entry gate and immediately see the Observation Tower and the end of the Grand Plaza. Its strong axial relationship across the plaza creates a dramatic moment of arrival for spectators, and the tower becomes a point of reference throughout the complex. The landmark 250-foot Observation Tower rises over the racetrack, offering sweeping views of the entire complex, downtown Austin and the nearby Hill Country from a platform at an elevation of 230 feet. A series of 18 red steel tubes cascades down the tower to form a canopy for the amphitheater stage below.